Looking mildly amused by all the fuss, a hatless Brad Paisley stood on the Grand Ole Opry stage in Nashville Tuesday afternoon and listened to friends and associates praise him, his co-writers and his recording partners for his two latest No. 1 singles -- "Old Alabama" and "Remind Me." 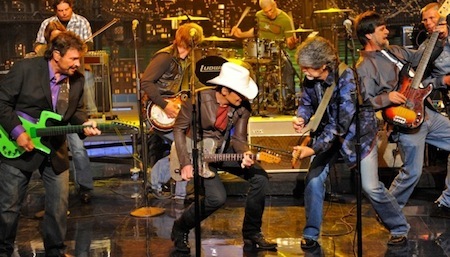 Flanking Paisley were Randy Owen, Teddy Gentry and Jeff Cook of the group Alabama, who sang with him on the former song, and Carrie Underwood, who sparred vocally with him on the latter.